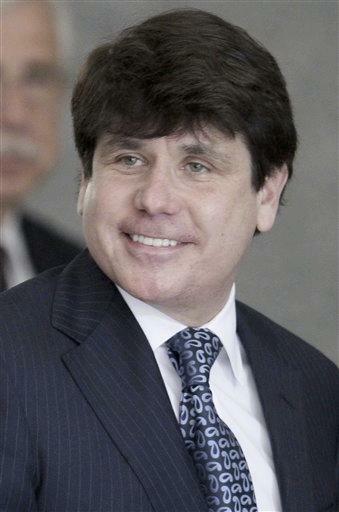 CHICAGO (AP) - Rod Blagojevich's name resurfaced in the Chicago mayoral race Tuesday when his attorneys named leading candidate and former White House chief of staff Rahm Emanuel in a motion claiming key evidence is missing in the impeached Illinois governor's upcoming retrial on corruption charges. Blagojevich's motion alleges a record of a phone call between a top Blagojevich aide and Emanuel is among "mysteriously missing" evidence. Blagojevich's attorneys asked a judge to order prosecutors to turn over records of the call, saying it would strengthen the former governor's claim of innocence. The call allegedly took place just a day before Blagojevich's December 2008 arrest on charges that include allegations that he sought to sell or trade the appointment to President Barack Obama's vacated Senate seat for personal gain. His attorneys argue the conversation could bolster a defense contention that Emanuel, who has not been accused of any wrongdoing, was willing to help with a legitimate political deal in which Blagojevich would have named Illinois' attorney general to the seat. Blagojevich was convicted on just one of 24 charges against him last fall, but prosecutors vowed to retry him. That second trial is scheduled to begin in April. The motion was filed ahead of a deadline next week for all pretrial motions and comes exactly two weeks before Chicago voters decide among Emanuel and five other candidates in the Feb. 22 election to replace retiring Mayor Richard Daley. Emanuel has a considerable fundraising advantage and leads in polls. Defense attorney Sheldon Sorosky said the timing of the motion was unrelated to the election and was not designed to affect Emanuel politically. "It might help him - because it shows he didn't do anything wrong," Sorosky said. Blagojevich has seized on opportunities to proclaim his innocence publicly. A media blitz before his first trial included an appearance on TV's "Celebrity Apprentice, but he has kept a relatively low profile in advance of the retrial. While campaigning Tuesday, Emanuel downplayed the court filing and said he was not concerned about it. He referred to a "comprehensive review" completed by Obama's White House transition team in 2008 that investigated contacts between Obama aides and Blagojevich aides and found "nothing inappropriate or any deal making." Emanuel also harkened back to a wiretap recording played at the first trial in which Blagojevich is heard cursing Obama's team because it did not seem prepared to offer him more than gratitude if he appointed an adviser of Obama's to the Senate seat. "I'm not in the business of interpretation, but I know what I said, which was, 'You're going to get thanks and appreciation," Emanuel told reporters Tuesday about his message to Blagojevich. "And you also know how the governor responded to appreciation." The defense claims in its motion that the call should be, but is not, among hundreds of transcripts of secret FBI wiretaps recorded before Blagojevich's arrest. The motion points only to circumstantial evidence that the call occurred, including a reference in the Obama transition-team report that said Emanuel had "about four" conversations with then Blagojevich chief of staff John Harris. Blagojevich's lawyers say prosecutors delivered to them evidence of only three calls. "The fourth and final phone call is the call that is mysteriously missing," the motion states. "Piecing together multiple documents after the first trial, Blagojevich uncovered the fact that the December 8th phone call ... took place." A spokeswoman for the U.S. attorney's office in Chicago, Kim Nerheim, declined to comment Tuesday. The motion contends that details of the conversation would support Blagojevich's claim that he merely hoped to forge a legitimate deal in which he would name Illinois Attorney General Lisa Madigan to the Senate seat. In exchange, her father, Illinois House Speaker Michael Madigan, would supposedly push a legislative package favored by the governor. Prosecutors have portrayed the supposed Madigan deal as a red herring designed to obscure multiple bids by Blagojevich to effectively sell the seat not for the benefit of his Illinois constituents, but for his own personal gain. Associated Press staff writer Deanna Bellandi contributed to this report.